jar & mix together. Just use 1/4 tsp. of the mixture (homemade baking powder ) for this recipe. In a large bowl, combine the ricotta cheese, honey and stevia. Whisk to combine thoroughly. Add the arrowroot flour and the baking powder to the mixture and whisk until batter is smooth. Liberally grease a 9x9 square baking pan or dish. Pour batter into the pan or dish. Bake cake for 1 hour or until cake is firm . Test by pressing gently with a spatula or spoon. 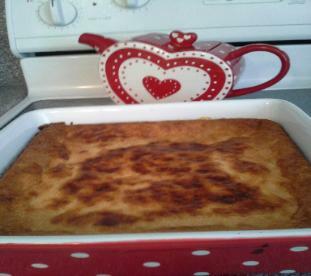 Cool cake for one hour then chill in refrigerator for another hour before serving. Top each slice with cinnamon and/ whipped cream from my book. corn. Most corn is genetically modified.